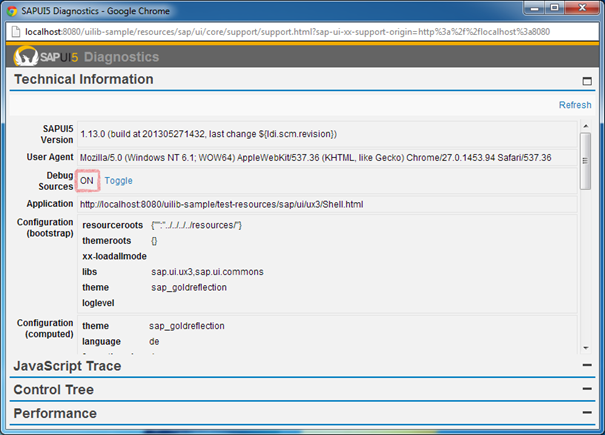 SAPUI5 diagnostics is a support tool that runs within an existing SAPUI5 application. To call the support tool, use the following shortcut: CTRL+SHIFT+ALT+S. 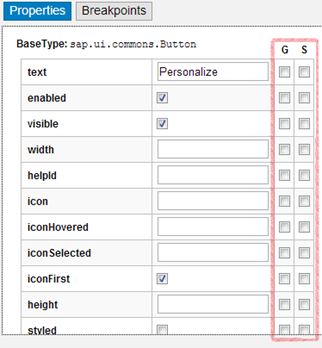 The following sections describe the functions SAPUI5 provides in the support tool. To use the debugging function, it is important to use the debug sources. For this, set the Debug Sources function to ON. The control tree shows all controls that are contained in the application in a tree view. You can select controls either directly in the application by choosing CRTL+SHIFT+ALT and clicking on the control, or by selecting the control in the control tree. On the Properties tab you can change the defined properties of the selected control. In the example below, you can change the value, the text direction, and enable or disenable the control. 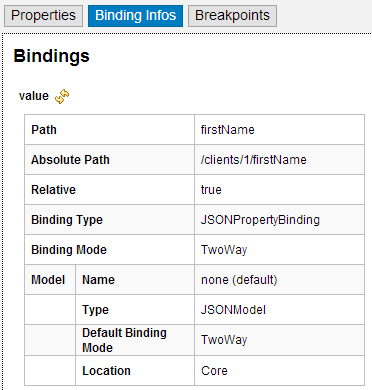 The Binding Infos tab shows all existing bindings for the selected control together with additional information. To update the binding, choose Refresh. You can also see the binding context for the selected control. To navigate to the respective controls, use the hyperlinks. On the Properties tab, you can add or remove breakpoints. Use the respective checkbox to add or remove a breakpoint for the get/set method of a control property. On the Breakpoints tab, you can add or remove breakpoints for methods. You can either select the method from the dropdown box, or use auto completion. To set the breakpoint, select the method and choose Add breakpoint. To remove a breakpoint, select the red x. To debug a method, open and activate you browser's debugging tool. If you execute a method with an active breakpoint, the script stops at the debugger statement. To open the method, use the step-over/into function of your debugger. The Debugging view allows you to set breakpoints for methods on class level. Select the class from the dropdown box or enter the name of the class. Choose Add to set the breakpoint. For each class, the system shows the number of active breakpoints and all methods. 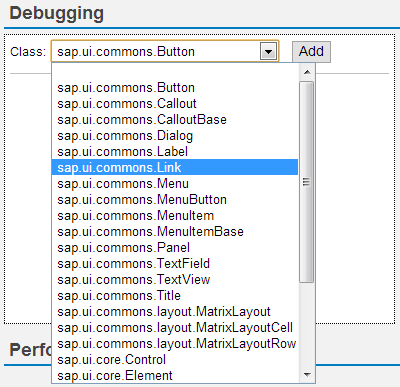 Run the SAPUI5 app in your browser, for example, open a page in the test suite. Open the support tool by choosing CTRL+ALT+SHIFT+S. Open the Control Tree panel. Select the root UI area in the tree on the left hand side. Open the Export tab and choose Export XML. Open the ZIP archive and extract the files to your file system. If your app does not contain views, the content is put in one view in the output. If your app contains views and all views are loaded, the content is output as separate files. The conversion captures the runtime status of the app. This can differ from the build declaration.